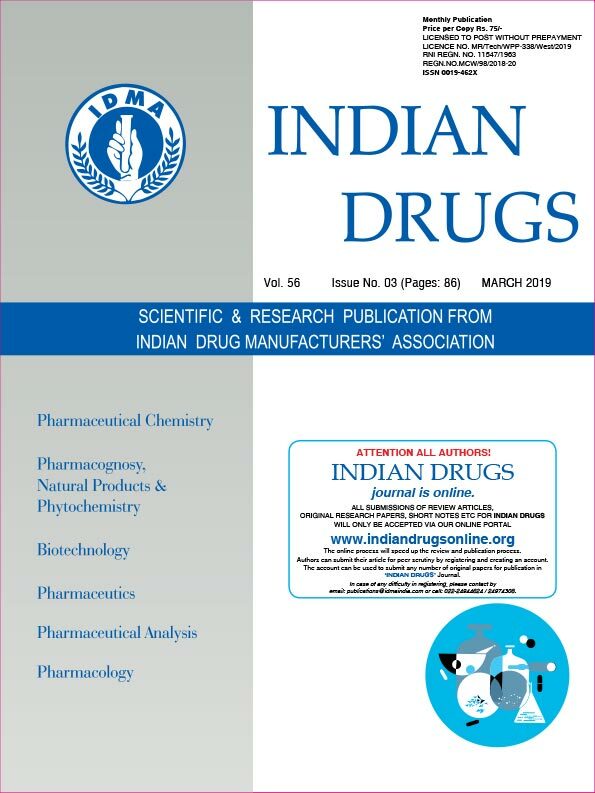 Indian Drugs is the scientific publication of the Indian Drug Manufacturers' Association (IDMA). The journal was started in 1963. Indian Drugs is published monthly and is respected for its peer-reviewed scientific and technical papers. The publication has a circulation of 1800 copies and is distributed to all IDMA members as a members privilege. It is also available by subscription to members of the industry, university libraries and government departments. Review - Shifting Paradigm For Validation of Medicinal Plants in Indian Traditional Medicine. Taste Making of Oxybutynin Chloride using Lipid Excipients and Formulation as Orodispersible Tablets for Geriatric Population. Formulation and in-vitro Evaluation of Zolmitriptan in situ Gel for Nasal Administration.